A new video series features Ivy League students talking to America’s best and brightest high school students to give them a realistic idea of what lies ahead. 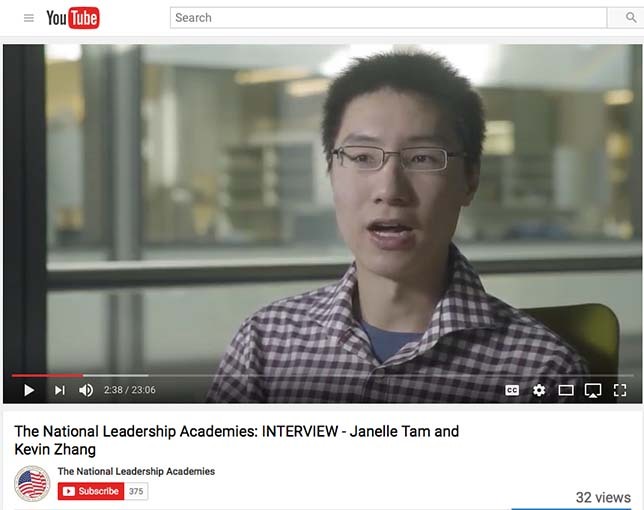 The interviews can be found on the National Leadership Academies’ YouTube channel. Princeton students and award-winning aspiring medical scientist, Janelle Tam, have teamed up with the National Leadership Academies to provide current high school students an insight into how Ivy League university students have accomplished their goals to date, and what students can do to achieve and reach their ambitions. Tam is the winner of the 2012 Sanofi BioGENEius Challenge of Canada. She is a current senior at Princeton University, where she is majoring in molecular biology with a certificate in global health and health policy. Tam is a speaker and mentor for students at the Congress of Future Medical Leaders held outside Boston. The Congress is an annual gathering of the nation’s brightest future medical leaders, who possess leadership potential and a desire to contribute to the medical profession as a physician or medical scientist. The colleagues Janelle interviews in this series offer unfiltered guidance and personal experiences with overcoming failure and handling the stressful college admissions process. They also offer advice to American students on how to achieve high goals and remain successful. In the interview series, Tam sits down with several Princeton students in different majors and graduation years. They include a current medical student enrolled in an Ivy League M.D./Ph.D. program, a former Olympian and a filmmaker. In the first video, Tam interviews Kevin Zhang, who talks about his experiences with the college admissions process, his passion for science, and how to overcome failure. The National Leadership Academies support America’s high achieving high school students through career and focus-area programs and services. The organization has created the National Academy of Future Physicians and Medical Scientists and the National Academy of Future Scientists and Technologists, supporting students with the skills, motivation, guidance and mentorship they need to stay on track and achieve their goals. To learn more about the National Leadership Academies, visit their website.